# Yubin Li, Haiyan Zhu, and Shaofei Wang contributed equally to this work. Poly-amidoamine (PAMAM) dendrimers are proposed to be one of the most promising drug-delivery nanomaterials. However, the toxicity of PAMAM dendrimers on the central nervous system seriously hinders their medical applications. The relationship between oxidative stress and autophagy induced by PAMAM dendrimers, and its underlying mechanism remain confusing. In this study, we reported that PAMAM dendrimers induced both reactive oxygen species and autophagy flux in neuronal cells. Interestingly, autophagy might be triggered by the formation of reactive oxygen species induced by PAMAM dendrimers. Suppression of reactive oxygen species could not only impair PAMAM dendrimers-induced autophagic effects, but also reduce PAMAM dendrimers-induced neuronal cell death. Moreover, inhibition of autophagy could protect against PAMAM dendrimers-induced neuronal cell death. These findings systematically elucidated the interplay between oxidative stress and autophagy in the neurotoxicity of PAMAM dendrimers, which might encourage the application of antioxidants and autophagy inhibitors to ameliorate the neurotoxicity of PAMAM dendrimers in clinic. Due to their unique chemical, mechanical and biological properties, functionalized nanomaterials designed for the commercial and medical applications have been widely researched, changing the prospect of pharmaceutical and biotechnology industries[1, 2]. Among them, poly-amidoamine (PAMAM) dendrimers are highly promising nanomaterials for therapeutic and diagnostic purposes[3-5]. Although PAMAM dendrimers have been developed as multifunctional therapeutic agents for anti-pathogen or anti-tumor treatments, the toxicological effects of PAMAM dendrimers seriously limited their applications . It has been confirmed that PAMAM dendrimers could promote acute lung injury, disrupt key platelet functions, initiate blood clot formation and induce toxic response in the central nervous system[7-10]. But to date, the scientific basis for the cytotoxicity of nanomaterials is not well elucidated, and understanding of the role and mechanism of toxicity induced by PAMAM dendrimers is still finite. An important mechanism of nanotoxicity is the abnormal generation of reactive oxygen species (ROS)[11, 12]. A series of literatures have reported that oxidative stress triggered by overproduction of ROS could induce cellular damage and influence apoptotic or pro-inflammatory signaling pathway: Exposure to silver nanoparticles leads to the induction of ROS and apoptosis in mouse embryonic fibroblasts; Titanium nanoparticles induced renal fibrosis via oxidative stress upregulation; Titanium dioxide nanoparticles evoked strong oxidative stress and mitochondrial damage in glial cells; Zinc oxide nanoparticles could induce ROS generation by depleting antioxidant enzymes in macrophages[13-15]. Moreover, scientists have investigated that PAMAM dendrimers-induced cytotoxicity was triggered by ROS in mouse macrophage cells, while PEGylation could decrease PAMAM dendrimers-induced cytotoxicity via attenuation of oxidative stress[16, 17]. Macroautophagy (hereafter referred to as autophagy) is a self-digesting process that is implicated in multiple biological processes including cell death and differentiation, aging and neurodegenerative diseases, tumor occurrence and development. Activation of autophagy requires formation of autophagosomes where eukaryotes degrade dysfunctional proteins and damaged organelles by lysosomal enzymatic content. Characterized by the accumulation of autophagosomes and autophagolysosomes in the cytoplasm, autophagy has been classified as a new morphological form of programmed cell death. Previous studies have reported that a variety of nanoparticles such as silica, ceria, quantum dots, and silver nanoparticles could trigger autophagy in various cell lines[21-23]. Researchers found that zinc oxide nanoparticles induced ROS generation in macrophages and simultaneously induced autophagy and apoptosis, indicating that autophagy might be a cellular defense mechanism against ROS. We have also confirmed that PAMAM dendrimers could induce autophagy in human glioma cells, but the underlying relationship and mechanism between ROS and autophagy in PAMAM dendrimers-induced neuronal cell death are still unknown. A variety of evidence suggested that ROS were early inducers of autophagy upon nutrient deprivation; meanwhile, ROS were also involved in the process of autophagy and regulated by autophagy under other pathological conditions such as brain injury and tumor. As mitochondria were main source of ROS in autophagy signaling, mitophagy became the major breakthrough to link ROS and autophagy, with series of molecular mechanisms underlying mitophagy characterized. Besides, ROS could modify DNA and induce DNA damage; when DNA became unrepaired and apoptosis was defective, DNA damage-triggered autophagy contributed to cell death. Thus, elucidating the interaction between ROS and autophagy would facilitate the management of PAMAM dendrimers-induced nanotoxicity. The primary aim of the study was to explore the relationship between oxidative stress and autophagy in neurotoxicity induced by PAMAM dendrimers and to develop the new mechanism of PAMAM dendrimers-induced neurotoxicity. In the current research, we studied the generation of ROS and autophagy flux in pheochromocytoma cell line PC-12 and human neuroblastoma cell line SH-SY5Y treated with PAMAM dendrimers. Antioxidant N-acetyl cysteine (NAC), lipoic acid (LA), and tocopherol were used to gain a preliminary insight into the cellular response (autophagic and cytotoxicological effects) to PAMAM dendrimers exposure by regulating oxidative stress. To further investigate the interplay between oxidative stress and autophagy in PAMAM dendrimers-induced neuronal cell death, the effects of PAMAM dendrimers combined with autophagy inhibitors (LY294002 and chloroquine) or autophagy activators (trehalose and rapamycin) were also examined in PC-12 cells. This study systematically elucidated the relationship between oxidative stress and autophagy in the neurotoxicity triggered by PAMAM dendrimers and suggested the application of antioxidants and autophagy inhibitors in ameliorating PAMAM dendrimers-induced neurotoxicity. The PI3K inhibitor LY294002 was obtained from Beyotime Institute of Biotechnology (Haimen, China). The lysosomal inhibitor chloroquine (CQ) and autophagy inducer trehalose were obtained from Sigma (St Louis, MO). Antioxidants N-acetyl cysteine (NAC), lipoic acid (LA), and tocopherol were purchased from Beyotime Institute of Biotechnology (Haimen, China). Bafilomycin A1 and Rapamycin were obtained from Sangon Biotech (Shanghai, China). Cyto-ID Green dye kit was purchased from ENZO Life Science (Farmingdale, NY, USA). MitoSox Red mitochondrial superoxide indicator was obtained from Life Technologies (Eugene, Oregon, USA). MEK 1/2 inhibitor U0126 was supplied by Cell Signaling Technology (Danvers, MA, USA). The antibodies used were as follows: anti-LC3B, anti-SQSTEM1/p62, anti-phospho-AKT (Ser473), anti-phospho-MTOR (Ser2448), anti-p70 S6 Kinase Phospho (pS371), anti-phospho-p44/42 MAPK (Erk 1/2) (Thr202/Tyr204), anti-tubulin were purchased from Cell Signaling Technology (Danvers, MA, USA); the second antibodies horseradish peroxidase (HRP)-conjugated goat anti-mouse and anti-rabbit immunoglobulin G (IgG) were obtained from Jackson ImmunoResearch Laboratories (West Grove, PA, USA). All cell culture reagents were purchased from Gibco (Carlsbad, CA, USA). PAMAM dendrimers G5 dissolved in methanol solution was obtained from Sigma-Aldrich (St. Lous, MO). For experiment use, PAMAM dendrimers were air dried, and then dissolved in 0.01 M phosphate-buffered saline (PBS) (pH7.4). The size distributions and zeta potentials of PAMAM dendrimers G5 were measured by photon correlation spectroscopy (3000HS; Malvern Instruments, Malvern, UK). The measurements were performed on 20 μM of PAMAM dendrimers solutions at 23℃ in methanol, Milli Q distilled water, PBS, RPMI-1640, or MEM/F-12 medium. Each sample was detected at least three times. UV/Visible absorption spectroscopic analyses of PAMAM dendrimers G5 solutions in PBS, RPMI-1640, or MEM/F-12 medium were performed by a Perkin Elmer Lambda 900 UV/visible/NIR absorption spectrometer. The spectroscopic measurements were performed on 15 μM of PAMAM dendrimers solutions. The rat pheochromocytoma cell line PC-12 and human neuroblastoma cell line SH-SY5Y were supplied by Cell Bank of Shanghai Institutes for Biological Science, Chinese Academy of Science (Shanghai, China). PC-12 cells were maintained in RPMI-1640 medium while SH-SY5Y cells were maintained in MEM/F-12 medium. All medium were supplemented with 10% heat-inactivated fetal bovine serum (Invitrogen, San Diego, CA, USA), 2mM L-glutamine, 100 U/mL of penicillin, and 100 μg/mL of streptomycin (Beyotime Institute of Biotechnology, Haimen, China). All cells were cultured continuously at 37oC in an incubator with 95% air and 5% CO2. Cell viability assay was measured by Cell Counting Kit-8 (CCK-8) (Dojin Laboratories, Kumamoto, Japan). Briefly, cells were plated and incubated in 96-well plates at a density of 1×104 cells/well for 24 h. When reaching 80% ~ 90% confluence, cells were treated with different concentrations of PAMAM dendrimers G5 for another 24 h. The plates were incubated with CCK-8 in an atmosphere of air containing 5% CO2 at 37 oC for 30 min, and then the absorbance was measured at 450 nm. Cells were washed with cold PBS, and kept in RIPA lysis buffer (Beyotime Institute of Biotechnology, Haimen, China) for 30 min on ice, and then the lysates were centrifuged to collect the supernatants. The concentration of protein was examined by the bicinchoninic acid (BCA) method. Equivalent amounts of protein were separated by sodium dodecyl sulfate-polyacrylaminde gelelectrophoresis (SDS-PAGE), and subsequently transferred to poly vinylidene fluoride membranes. The membranes were blocked in Tris-buffered saline and Tween 20 (TBST) containing 3% bovine serum albumin (BSA) for 1 h at room temperature, and then subjected to primary antibodies at 4 oC overnight. After incubation with the secondary antibody conjugated with horseradish peroxidase for 2 h at room temperature, membranes were washed in TBST and the signals were visualized using an enhanced chemiluminescent detection kit (Pierce, Rockford, IL). 1×105 cells were cultured in dishes with glass bottom for 12 h, and then treated with a series concentrations of PAMAM dendrimers G5 for different times. Cells were disposed with Cyto-ID Autophagy Detection Kit (ENZO Life Science, Farmingdale, NY, USA) and MitoSox Red mitochondrial superoxide indicator (Eugene, Oregon, USA) following the manufacturer's instruction . The images were observed and overlaid by an inverted confocal microscope (Carl Zeiss LSM710, Carl Zeiss, Germany). Lysotracker Red (Invitrogen, San Diego, CA, USA) was used to stain lysosomes and autophagolysosomes. PC-12 cells were incubated with PAMAM dendrimers G5 for a series of times, then Cyto-ID Green Dye, LysoTracker Red, and Hoechst 33342 were used to stain cells at 37 oC for 20 min. After that, cells were washed in RPMI-1640 medium and observed by confocal microscopy immediately. All the relative fluorescence intensity was measure by inverted confocal microscope software (Carl Zeiss LSM710, Carl Zeiss, Germany). Intracellular ROS generation was detected by reactive oxygen species assay kit (Beyotime Biotechnology, Haimen, China). Before experiment, 1×104 cells PC-12 cells were seeded in 96-well black plate per well for 24 h. After series of indicated experimental treatments, cells were loaded with 10 μM of fluorescent probe 2',7'-dichlorofluorescein diacetate (DCFH-DA) in serum-free RPMI-1640 medium for 20 min at 37 oC. And then cells were washed thrice with serum-free medium. DCF fluorescence intensity was detected by Tecan Infinite 200 PRO microplate reader to quantify levels of ROS. All the statistical analyses were measured by Graphpad Prism 5 (GraphPad Software Inc,. San Diego, CA). Data were presented as mean ± standard deviations (SD) and analyzed by the two-tailed Student t test. Levels of p<0.05 were considered as statistical significance. The characteristics and stability of PAMAM dendrimers G5 used in the experiment were detected in different media. As shown in Figure S1A, the average particle size of PAMAM dendrimers G5 in methanol, MQ water, PBS, RPMI-1640 medium, and MEM/F-12 medium were 5.45 nm, 5.53 nm, 6.02 nm, 5.89 nm, and 5.97 nm, respectively; and was superior to those quoted by the manufacturer. The zeta potential of PAMAM dendrimers G5 in MQ water and PBS was 23.57 mV and 21.30 mV, respectively; while the zeta potentials in RPMI-1640 medium and MEM/F-12 medium was 20.16 mV and 20.79 mV, respectively (Figure S1B); due to the cationic surface amino group of PAMAM dendrimers G5. However, the zeta potentials in PC-12 cell culture medium and SHSY-5Y cell culture medium became -6.27 mV and -3.78 mV. The lower zeta potential measured in PC-12 cell culture medium and SHSY-5Y cell culture medium suggested that the possible interplay between PAMAM dendrimers G5 and components in the media might induce PAMAM dendrimers aggregation as several literatures have ever reported. To explore the dendrimers stability in RPMI-1640 medium and MEM/F-12 medium, the average particle sizes and zeta potentials of PAMAM dendrimers G5 in relevant cell culture media were detected at different time, and the data were shown in Figure S1C -S1E. Additionally, the UV/Visible absorption spectrum of the PBS media with PAMAM dendrimers G5 showed characteristic peaks at ~210nm and ~290nm, while PAMAM dendrimers G5 in RPMI-1640 medium and MEM/F-12 medium also showed similar characteristic peaks at ~210nm and ~290nm (Figure S1F). Scientists have noticed that intracellular reactive oxygen species are widely responsible for the toxicity of several nanomaterials, and the critical role of reactive oxygen species has been highlighted in the PAMAM dendrimers-induced toxic responses[31, 32]. As mitochondrion is the major organelle generating ROS, and oxidative damage is tightly associated with mitochondrial dysfunction[33, 34]; MitoSox Red dye (oxidative fluorescence) and Cyto-ID Green dye (autophagic fluorescence) were used to determine whether formation of ROS would contribute to PAMAM dendrimers-induced autophagy. As shown in Figure 1, PAMAM dendrimers induced occurrence of oxidative fluorescence (red in web version) and accumulation of autophagic fluorescence (green in web version). The quantitative analysis of relative oxidative fluorescence and autophagic fluorescence intensity showed that PAMAM dendrimers induced continuous accumulation of oxidative fluorescence in the first 12 h, with enhanced accumulation of autophagic fluorescence observed in the first 24h (Figure S2A and S2B). Oxidative fluorescence reached the highest peak prior to autophagic fluorescence and quenched earlier than autophagic fluorescence. Similar results were also shown in PAMAM dendrimers-treated SHSY-5Y cells (Figure S3). These results suggested that PAMAM dendrimers induced both reactive oxygen species and autophagy in neuronal cells, while autophagy might be partly triggered by PAMAM dendrimers-induced reactive oxygen species in neuronal cells. Autophagy is an evolutionarily conserved process through which cells recruit damaged proteins and dysfunctional organelles to autophagosomes and then fuse with lysosomes for their degradation under stress conditions; thus it is crucial to determine whether stimulus could promote autophagy or just block the fusion of autophagosomes and lysosomes[35, 36]. Cyto-ID Green dye and LysoTracker Red dye were used to explore whether autophagic flux was induced in PAMAM dendrimers-treated neuronal cells. As shown in Figure 2A, PAMAM dendrimers induced formation of autophagosomes (green fluorescence in the web version), fusion of autophagosomes with lysosomes (yellow fluorescence in the web version) and clearance of autophagosomes (red fluorescence in the web version) in a time-dependent manner. Similar results were also observed in PAMAM dendrimers-treated SHSY-5Y cells (Figure S4). Besides, a series of zoomed-in images with a z-stack also showed the co-localization of autophagosome-related fluorescence and lysosomes-related fluorescence in Figure S5. Furthermore, PAMAM dendrimers-induced autophagic flux was also monitored by Bafilomycin A1 treatment. Bafilomycin A1, an inhibitor of vacuolar-type ATPase, inhibits the fusion of autophagosomes with lysosomes in the late stage of autophagy through suppressing vesicle acidification. Although Bafilomycin A1 inhibits autophagosomes from fusing with lysosomes, it has no effects on the occurrence of autophagosomes. As shown in Figure S6, after incubation with 10 μg/mL of PAMAM dendrimers for various times or with different concentrations of PAMAM dendrimers for 12 h, additional treatment of cells with Bafilomycin A1 caused a further increased level of LC3-II and p62 (Figure 2B and 2C, Figure S7); while autophagy positive control rapamycin induced increased level of LC3-II and decreased level of p62 (Figure 2D and 2E). As p62 is an ubiquitin-binding protein that directly binds to LC3, it could be used as a marker to study autophagic flux. When autophagy is inhibited, p62 accumulates; when autophagy is induced, p62 decreases. Thus, our results indicated that autophagic flux was induced in PAMAM dendrimers-treated PC-12 cells. Reactive oxygen species and autophagy were triggered by PAMAM dendrimers in PC-12 cells. Cells were plated in cell culture dishes with glass bottom. After treated with 10 μg/mL of PAMAM dendrimers G5 for 6h, 12h, 24h, and 36h, cell samples concurrently stained with Cyto-ID Green dye and MitoSox Red dye were analyzed by confocal microscopy. Untreated cells were used as negative control. Autophagic flux was induced by PAMAM dendrimers in PC-12 cells. (A) Cells were plated in cell culture dishes with glass bottom. 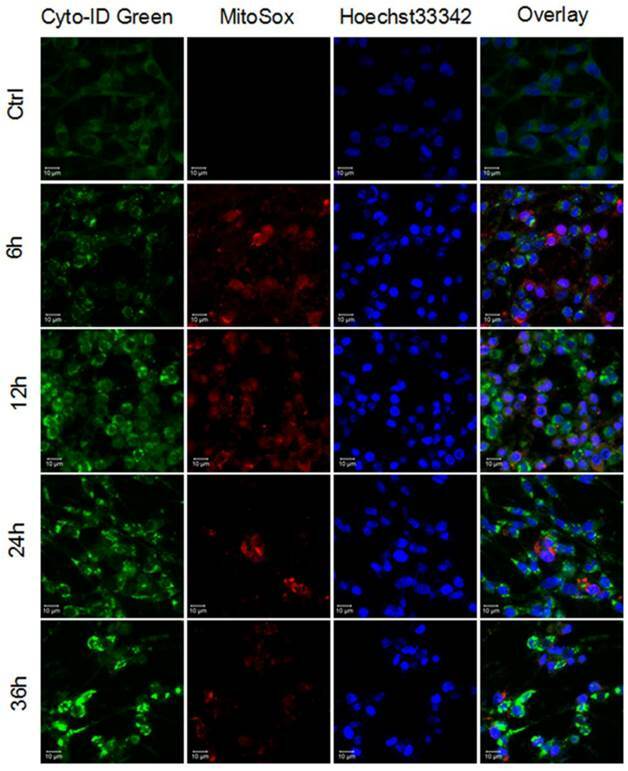 After treated with 10 μg/mL of PAMAM dendrimers G5 for 6h, 12h, 24h, and 36h, cell samples were stained with Cyto-ID Green autophagy dye and Lysotracker Red dye and analyzed by confocal microscopy. Untreated cells were used as negative control. (B) After exposure to 10μg/mL of PAMAM dendrimers G5 for indicated times, PC-12 cells were treated with or without 20 nM of Baf A1 for another 3 h. Changes in the expression of LC3 and p62 were examined by Western blot. (C) After exposure to a series of concentrations of PAMAM dendrimers for 24 h, PC-12 cells were treated with or without 20 nM of Baf A1 for another 3 h. Changes in expression of LC3 and p62 were examined by Western blot. (D) After exposure to 10μg/mL of PAMAM dendrimers G5 for indicated times, PC-12 cells were treated with or without 20 nM of Baf A1 for another 3 h. Changes in the expression of p62 was examined by Western blot. Cells treated by 10 nM of rapamycin for 24 h were as positive control. 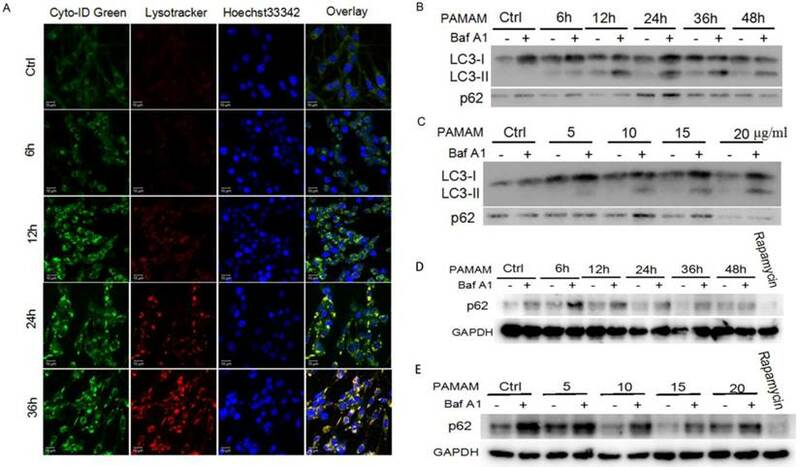 (E) After exposure to a series of concentrations of PAMAM dendrimers for 24 h, PC-12 cells were treated with or without 20 nM of Baf A1 for another 3 h. Changes in expression of p62 were examined by Western blot. Cells treated by 10 nM of rapamycin for 24 h were as positive control. To explore the role of reactive oxygen species in autophagy triggered by PAMAM dendrimers in neurocytes, antioxidants such as NAC, lipoic acid, and tocopherol were applied to inhibit reactive oxygen species in PAMAM dendrimers-treated PC-12 cells. Reactive oxygen species assay kit was used to confirm the suppression of oxidative stress by antioxidants (NAC, lipoic acid, and tocopherol) (Figure 3A). Compared with PAMAM dendrimers treatment alone, pretreatment with antioxidants impaired accumulation of reactive oxygen species-associated fluorescence (red in the web version) induced by PAMAM dendrimers. Meanwhile, autophagic fluorescence (green in the web version) triggered by PAMAM dendrimers was also suppressed by antioxidants (Figure 3B). The larger versions of these confocal images were shown in Figure S8. The quantitative analysis of relative oxidative fluorescence intensity showed that PAMAM dendrimers obviously induced oxidative fluorescence, while antioxidants significantly reduced the accumulation of oxidative fluorescence (Figure 3C). As shown in Figure 3D, antioxidants significantly suppressed the autophagic fluorescence triggered by PAMAM dendrimers in PC-12 cells. Figure S9 showed that antioxidants NAC and lipoic acid could also impair PAMAM dendrimers-induced autophagic fluorescence accumulation in SHSY-5Y cells. Western blot analysis was also used to detect autophagy inhibitory effects of antioxidants. As shown in Figure 3E, antioxidants treatment obviously reduced highly-expressed LC3-II protein level induced by PAMAM dendrimers in PC-12 cells. In summary, these results suggested that suppression of reactive oxygen species could impair PAMAM dendrimers-induced in PC-12 cells. Suppression of reactive oxygen species impaired PAMAM dendrimers-induced autophagic effects. (A) PC-12 cells were incubated with or without PAMAM dendrimers in the presence or absence of antioxidants for 24h. Cell samples were treated with DCFH-DA and analyzed by microplate reader to quantify levels of ROS. *p<0.05 versus Ctrl, and #p<0.05 versus PAMAM dendrimers G5-treated group. (B) PC-12 cells were incubated with or without PAMAM dendrimers in the presence or absence of antioxidants for 24h. Cell samples were stained with Cyto-ID Green dye and MitoSox Red dye and analyzed by confocal microscopy. (C) and (D)The relative oxidative fluorescence and autophagic fluorescence intensity were quantified by confocal microscopy software. All data were presented as the means ± SD of more than three samples. *p<0.05 versus Ctrl, or versus PAMAM dendrimers G5-treated group. (E) PC-12 cells were treated as was described in (A). The whole protein was extracted, and LC3 was analyzed by Western blot. To explore whether reactive oxygen species contributed to PAMAM dendrimers-induced neurotoxicity, the growth inhibitory effects induced by PAMAM dendrimers were detected after reactive oxygen species were blocked. As shown in Figure 4A and 4B, PAMAM dendrimers induced growth inhibition of PC-12 cells in a dose-dependent manner, while 5 mM or 10 mM of NAC remarkably impaired cytotoxicity of PAMAM dendrimers. 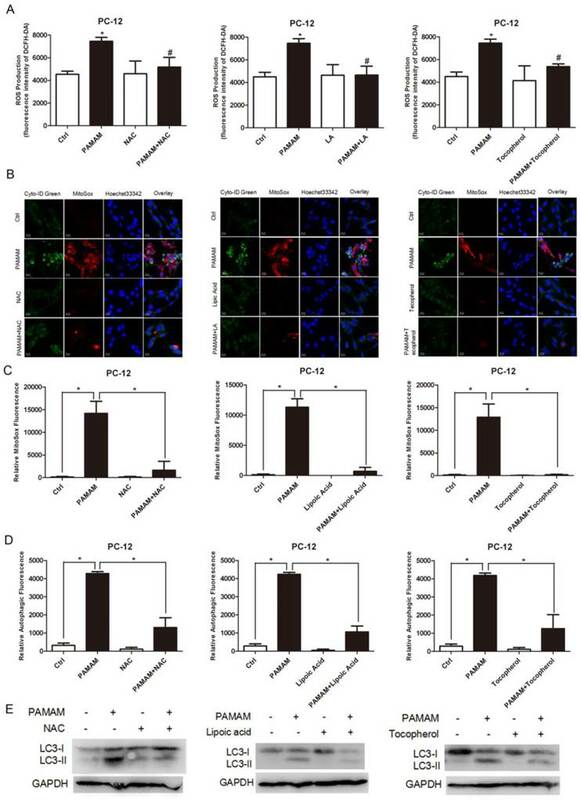 Besides, different concentrations of antioxidants lipoic acid (10 μM or 100 μM) and tocopherol (200 μM or 400 μM) also obviously reduced PAMAM dendrimers-induced neurotoxicity in PC-12 cells (Figure 4C-4F). NAC and lipoic acid were also used to suppress reactive oxygen species accumulated in PAMAM dendrimers-treated human neuroblastoma SHSY-5Y cells, and growth inhibitory effects induced by PAMAM dendrimers were significantly suppressed after adding antioxidants NAC (5 mM and 10 mM) or lipoic acid (10 μM and 20 μM) (Figure S10). Blocking reactive oxygen species reduced PAMAM dendrimers-induced neuronal cell death. 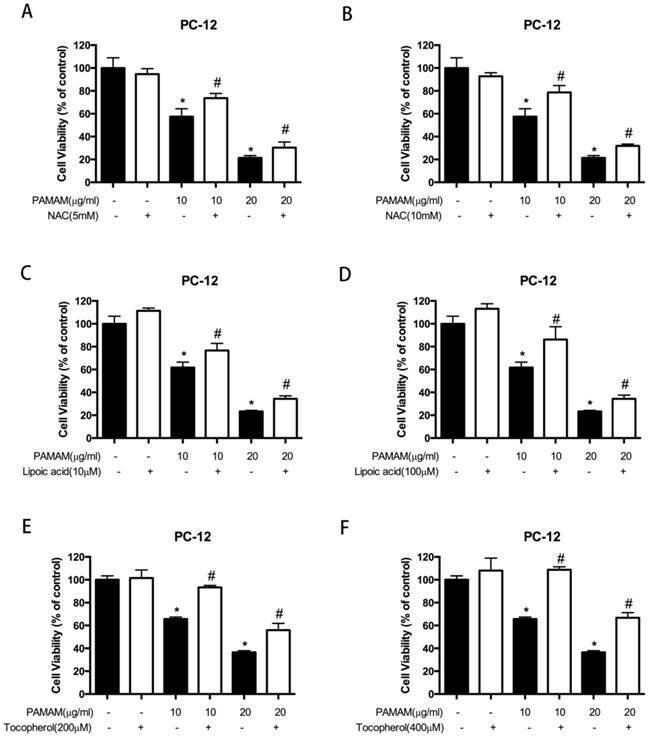 (A) and (B) PC-12 cells were incubated with or without PAMAM dendrimers in the presence or absence of NAC for 24h. Cell growth inhibition was analyzed by CCK-8. All data were presented as the means ± SD of four samples. *p<0.05 versus Ctrl, and #p<0.05 versus PAMAM dendrimers G5-treated group. (C) and (D) PC-12 cells were incubated with or without PAMAM dendrimers in the presence or absence of lipic acid for 24h. Cell growth inhibition was analyzed by CCK-8. All data were presented as the means ± SD of four samples. *p<0.05 versus Ctrl, and #p<0.05 versus PAMAM dendrimers G5-treated group. (E) and (F) PC-12 cells were incubated with or without PAMAM dendrimers in the presence or absence of tocopherol for 24h. Cell growth inhibition was analyzed by CCK-8 assay. All data were presented as the means ± SD of four samples. *p<0.05 versus Ctrl, and #p<0.05 versus PAMAM dendrimers G5-treated group. To assess the role of autophagy in PAMAM dendrimers-induced neuronal cell death, two autophagy inhibitors, LY294002 and CQ, were used to inhibit PAMAM dendrimers-induced autophagy. LY294002 is an inhibitor of phosphatidylinositol 3-phosphate kinase (PI3K) which could reduce the protein level of autophagosomic LC3 (LC3-II), while CQ inhibits fusion between the autophagosomes and lysosomes, and elevates LC3-II[38, 39]. 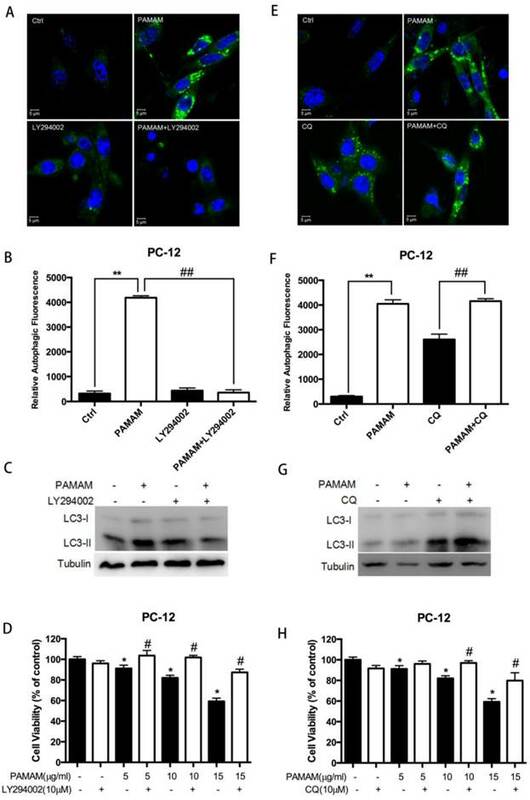 Confocal microscopy and Western blot analyses showed that LY294002 inhibited autophagy induced by PAMAM dendrimers in PC-12 cells and decreased LC3-II formation (Figure 5A and 5C). In contrast, PAMAM dendrimers in combination with CQ enhanced green fluorescence and LC3-II protein levels (Figure 5E and 5G). The quantitative analysis of relative autophagic fluorescence intensity showed that LY294002 significantly impaired PAMAM dendrimers-triggered autophagic fluorescence, while CQ treatment enhanced autophagic fluorescence (Figure 5B and 5F). Moreover, the pre-processing of autophagy inhibitors (LY294002 or CQ) before PAMAM dendrimers exposure significantly reduced the cytotoxicity of PAMAM dendrimers in PC-12 cells (Figure 5D and 5H). To further confirm the role of autophagy induced by PAMAM dendrimers in PC-12 cells, two autophagy activators, trehalose and rapamycin, were employed to detect the effects of autophagy activation on the neurotoxicity of PAMAM dendrimers[40, 41]. 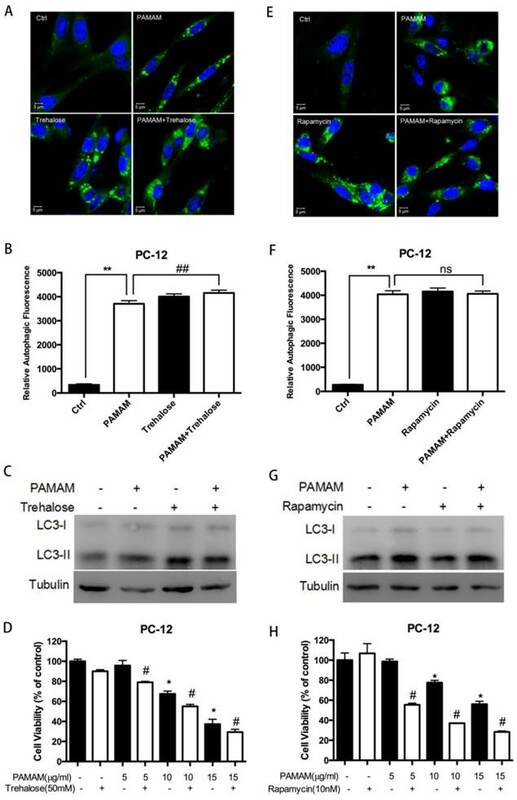 Confocal microscopy and western blot analysis showed that trehalose and rapamycin clearly enhanced autophagy induced by PAMAM dendrimers in PC-12 cells by inducing autophagic fluorescence accumulation (Figure 6A and 6E) and LC3-II protein formation (Figure 6C and 6G). The quantitative analyses of relative autophagic fluorescence intensity were shown in figure 6B and 6F. Compared with PAMAM dendrimers treatment alone, trehalose and rapamycin significantly enhanced the toxicity of PAMAM dendrimers in PC-12 cells (Figure 6D and 6H). Taken together, these results confirmed that inhibition of autophagy protected against PAMAM dendrimers-induced neuronal cell death. AKT/MTOR/p70S6K signaling pathway plays an important role in cell proliferation, survival and apoptosis, and is one of the primary pathways regulating autophagy in eukaryotic cells. Researchers have demonstrated that autophagy is negatively regulated by the activation of the mammalian target of rapamycin (MTOR) as MTORC1 could regulate autophagy in response to pathophysiological stress[43, 44]. As showed in Figure 7A and 7B, PAMAM dendrimers decreased the phosphorylation (at Ser473) of the AKT protein in PC-12 cells in a dose- and time-dependent manner, respectively. The change of phosphorylated form of the MTOR (at Ser2448) after PC-12 cells were exposed to PAMAM dendrimers was similar to that of phosphorylated AKT protein. Exposure to PAMAM dendrimers also resulted in a diminished level of phosphorylation of the MTOR target, p70 ribosomal protein S6 kinase (p70S6K), revealing a potent inhibitory effect of the PAMAM dendrimers treatment on the AKT/MTOR signaling pathway. The mitogen-activated protein kinases (MAPKs) involving extracellular signal-regulated kinase (ERK), JNK and p38, have been found to be the protein responsible for ROS induction. Meanwhile, MAPK activation has been previously reported to contribute to autophagy effects. Thus, ERK 1/2 signaling pathway may play an important role in oxidative stress and autophagy induced by PAMAM dendrimers. As shown in Figure 8A, exposure of PC-12 cells to PAMAM dendrimers resulted in an increase of ERK 1/2 phosphorylation (at T202/Y204) in a dose- and time- dependent manner. To further investigate the role of ERK 1/2 in oxidative stress and autophagy induced by PAMAM dendrimers, an inhibitor of MEK1 and MEK2, U0126, was used to block the phosphorylation of ERK 1/2. PC-12 cells were incubated with 20 μM of U0126 for 2 h, and then treated with PAMAM dendrimers for 24 h. Reactive oxygen species assay showed that U0126 could obviously suppress the generation of reactive oxygen species triggered by PAMAM dendrimers in PC-12 cells (Figure 8B). Confocal microscopy analyses presented that inhibiting phosphorylated ERK 1/2 notably weakened autophagic fluorescence and oxidative fluorescence signal in PAMAM dendrimers-treated PC-12 cells (Figure 8C). The quantitative analysis of relative fluorescence intensity showed that U0126 significantly impaired both autophagic fluorescence and oxidative fluorescence induced by PAMAM dendrimers in PC-12 cells (Figure 8D and 8E). Meanwhile, western blot analysis showed that phosphorylation of ERK 1/2 was suppressed by U0126, and inhibition of phosphorylation of ERK 1/2 obviously decreased the protein level of LC3-II (Figure 8F). 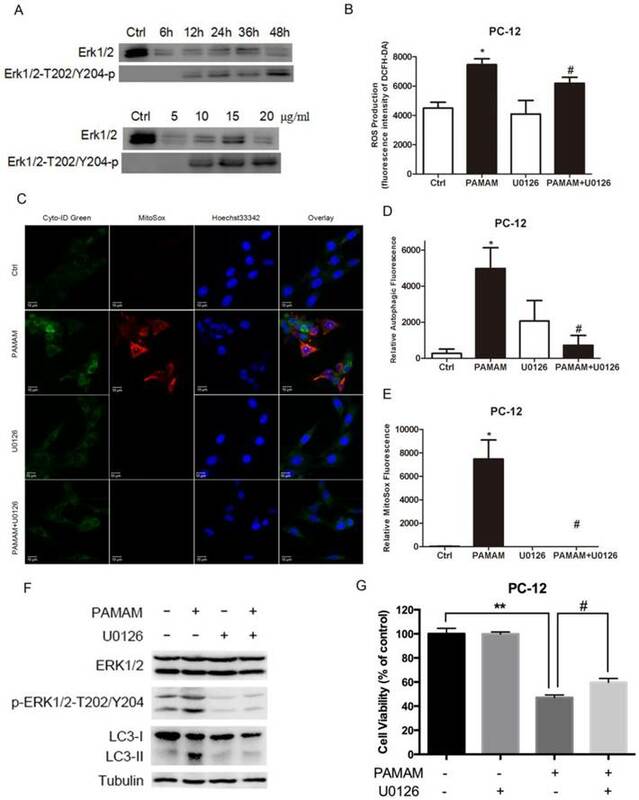 Furthermore, suppression of ERK 1/2 signaling pathway could significantly protect against PAMAM dendrimers-induced neurotoxicity in PC-12 cells (Figure 8G). Inhibition of autophagy protected against PAMAM dendrimers-induced neuronal cell death. (A) PC-12 cells were incubated with or without PAMAM dendrimers in the presence or absence of the autophagy inhibitor LY294002 for 24 h. Cell samples were stained with Cyto-ID Green dye and analyzed by confocal microscopy. Untreated cells were used as negative control. (B) The relative autophagic fluorescence intensity was quantified by confocal microscopy software. All data were presented as the means ± SD of more than three samples. (C) PC-12 cells were treated as described in (A). The whole protein was extracted, and LC3 was analyzed by Western blot. (D) PC-12 cells were treated as was described in (A). Cell growth inhibition was analyzed by CCK-8. All data were presented as the means ± SD of four samples. *p<0.05 versus Ctrl, and #p<0.05 versus PAMAM dendrimers G5-treated group. (E) PC-12 cells were incubated with or without PAMAM dendrimers in the presence or absence of the autophagy inhibitor CQ for 24 h. Cell samples were stained with Cyto-ID Green autophagy dye and analyzed by confocal microscopy. Untreated cells were used as negative control. (F) The relative autophagic fluorescence intensity was quantified by confocal microscopy software. All data were presented as the means ± SD of more than three samples. (G) PC-12 cells were treated as was described in (E). The whole protein was extracted, and LC3 was analyzed by Western blot. (H) PC-12 cells were treated as was described in (E). Cell growth inhibition was analyzed by CCK-8. All data were presented as the means ± SD of four samples. *p<0.05 versus Ctrl, and #p<0.05 versus PAMAM dendrimers G5-treated group. Autophagy activators enhanced cytotoxicity of PAMAM dendrimers in PC-12 cells. (A) PC-12 cells were incubated with or without PAMAM dendrimers in the presence or absence of the autophagy inducers trehalose for 24 h. Cell samples were stained with Cyto-ID Green autophagy dye and analyzed by confocal microscopy. Untreated cells were used as negative control. (B) The relative autophagic fluorescence intensity was quantified by confocal microscopy software. All data were presented as the means ± SD of more than three samples. (C) PC-12 cells were treated as was described in (A). The whole protein was extracted, and LC3 was analyzed by Western blot. (D) PC-12 cells were treated as was described in (A). Cell growth inhibition was analyzed by CCK-8. All data were presented as the means ± SD of four samples. *p<0.05 versus Ctrl, and #p<0.05 versus PAMAM dendrimers G5-treated group. (E) PC-12 cells were incubated with or without PAMAM dendrimers in the presence or absence of the autophagy inducer rapamycin for 24 h. Cell samples were stained with Cyto-ID Green dye and analyzed by confocal microscopy. Untreated cells were used as negative control. (F) The relative autophagic fluorescence intensity was quantified by confocal microscopy software. All data were presented as the means ± SD of more than three samples. (G) PC-12 cells were treated as was described in (E). The whole protein was extracted, and LC3 was analyzed by Western blot. (H) PC-12 cells were treated as was described in (E). Cell growth inhibition was analyzed by CCK-8 assay. All data were presented as the means ± SD of four samples. *p<0.05 versus Ctrl, and #p<0.05 versus PAMAM dendrimers G5-treated group. AKT/MTOR signaling pathways were involved in PAMAM dendrimers-induced autophagy. (A) PC-12 cells were seeded in a 6-well plate at an initial density of 2 × 105 cells per well. After 24 h of stabilization, cells were treated with 10 μg/mL of PAMAM dendrimers G5 for indicated times. The same blot was used to probe pAKT, mTOR, pMTOR, pP70S6K, and LC3. Changes in pAKT, mTOR, pMTOR, pP70S6K, and LC3 were examined by Western blot. (B) PC-12 cells were treated with different concentrations of PAMAM dendrimers G5 for 24 h. The same blot was used to probe pAKT, mTOR, pMTOR, pP70S6K, and LC3. Changes in the expression of pAKT, mTOR, pMTOR, pP70S6K, and LC3 were examined by Western blot. Collectively, our results suggested that ERK 1/2 signaling pathway played a key role in interplay between oxidative stress and autophagy induced by PAMAM dendrimers in PC-12 cells. Up to date, it has been reported that cationic PAMAM dendrimers could induce acute lung injury and liver damage, disrupt key platelet functions, initiate blood clot formation, impair mitochondrial oxidation in brain tissue, and induce central nervous system injury[7-9]. Meanwhile, PAMAM dendrimers-induced cytotoxicity was tightly correlated with the physical properties of nanomaterials themselves, such as surface charge and generation[46, 47], but the understanding of underlying interaction mechanism between PAMAM dendrimers and organ during their toxicity was still limited. Several literatures have reported that PAMAM dendrimers could induce nanoscale holes formation, trigger net cell plasma membrane porosity, and activate lysosomal apoptotic pathway at therapeutically relevant concentrations. Meanwhile, PAMAM dendrimers could induce fibrinogen aggregation and contribute to disseminate intravascular coagulation (DIC)-like condition through electrostatic interaction between cationic dendrimer surface and negatively charge fibrinogen domain . In terms of mechanisms of toxicity, researchers have demonstrated that the accumulation of reactive oxygen species was the main mechanism of PAMAM dendrimers-induced toxicity. Meanwhile, our previous studies have pointed out that autophagy, an evolutionarily conserved process for engulfing cytoplasmic materials into autophagosomes and degrading damaged organelles in lysosomes may represent a new mechanism in toxicity triggered by PAMAM dendrimers[24, 29, 49]. Nowadays, nanomaterials such as quantum dots, silver nanoparticles, zinc oxide, and titanium dioxide nanoparticles, have been widely proved to induce autophagy and oxidative stress in various cells. Oxidative stress and autophagy could be triggered independently or dependently of each other in nanoparticles-induced toxicity: Lee ever reported cytotoxicity, oxidative stress, apoptosis and the autophagic effects of silver nanoparticles in mouse embryonic fibroblasts independently; while Wan reported that gold nanorods could induce cell apoptosis and autophagy by damaging mitochondria and activating intracellular reactive oxygen species, Gorojod pointed out that manganese-mediated generation of reactive oxygen species could promote cellular damage, leading to apoptotic cell death in neuronal cells, while the autophagic-lysosomal pathway could determine the fate of neuronal cells under manganese-induced oxidative stress condition. Thus, the relation between reactive oxygen species and autophagy in nanoparticles-triggered toxicity is confusing, and whether reactive oxygen species were essential for autophagy induction is still unclear, especially in PAMAM dendrimers-induced neurotoxicity. To address this problem, the effects of a series of antioxidants on autophagy and cytotoxicity in PAMAM dendrimers-treated neuronal cells were investigated. Incubation with antioxidants before PAMAM dendrimers exposure could obviously impair autophagic effects, abolish the formation of LC3-II and reduce cytotoxicity in neuronal cells. Meanwhile, autophagy inhibitors could also protect against PAMAM dendrimers-induced neuronal cell death, whereas autophagy activators could enhance PAMAM dendrimers-induced growth inhibitory effect in PC-12 cells. These results in the present study ascertained the capacity of reactive oxygen species triggered by PAMAM dendrimers to induce autophagy in neuronal cells at an early stage, and revealed that antioxidants or autophagy inhibitors could impair PAMAM dendrimers-induced neurotoxicity. ERK 1/2 signaling pathway was activated in oxidative stress and autophagy induced by PAMAM dendrimers. (A) PC-12 cells were seeded in a 6-well plate at an initial density of 2 × 105 cells per well. After 24 h of stabilization, cells were treated with 10 μg/mL of PAMAM dendrimers G5 for indicated times, or treated with different concentrations of PAMAM dendrimers G5 for 24 h. The same blot was used to probe Erk 1/2 and pErk 1/2. Changes in Erk 1/2 and pErk 1/2 were examined by Western blot. (B) PC-12 cells were incubated with or without PAMAM dendrimers in the presence or absence of U0126 for 24h. Cell samples were treated with DCFH-DA and analyzed by microplate reader to quantify levels of ROS. *p<0.05 versus Ctrl, and #p<0.05 versus PAMAM dendrimers G5-treated group. (C) PC-12 cells were treated as was described in (B). Cell samples were stained with Cyto-ID Green autophagy dye and MitoSox Red dye and analyzed by confocal microscopy. (D) and (E) The relative oxidative fluorescence intensity was quantified by confocal microscopy software. All data were presented as the means ± SD of more than three samples. *p<0.05 versus Ctrl, or versus PAMAM dendrimers G5-treated group. (F) Cells were treated as was described in (B), the whole protein was extracted, changes in Erk 1/2, pErk 1/2, and LC3 were analyzed by Western blot. (G) Cell growth inhibition was analyzed by CCK-8 assay. All data were presented as the means ± SD of four samples. *p<0.05 versus Ctrl, and #p<0.05 versus PAMAM dendrimers G5-treated group. To further explore the underlying mechanism between oxidative stress and autophagy in PAMAM dendrimers-treated PC-12 cells, the activation of ERK 1/2 signaling pathway was examined. Recent studies have confirmed that ERK 1/2 was tightly responsible for ROS induction: MEK inhibitor could protect cells against oxidative stress; furthermore, our previous study found that ERK 1/2 activation contributed to autophagic effects; Autophagy proteins regulate ERK phosphorylation, and direct ERK activation promotes autophagy even in the absence of other stimuli[53, 54]. In this study, U0126, inhibitor of MEK1 and MEK2, was used to block the phosphorylation of ERK 1/2 triggered by PAMAM dendrimers. Oxidative effect and autophagic effect were both impaired after inhibiting ERK 1/2 phosphorylation. Meanwhile, the growth inhibitory effect induced by PAMAM dendrimers was also suppressed, which is similar to the effects of antioxidants or autophagy inhibitors, suggesting that ERK 1/2 signaling pathway might directly contribute to the interplay between oxidative stress and autophagy in PAMAM dendrimers-treated PC-12 cells. We demonstrated that reactive oxygen species and autophagic flux were triggered by PAMAM dendrimers in neuronal cells. Meanwhile, suppression of reactive oxygen species impaired autophagy and cytotoxicity induced by PAMAM dendrimers. Notably, inhibition of autophagy significantly protected against PAMAM dendrimers-induced neuronal cell death. These results indicated that PAMAM dendrimers-induced autophagy might be triggered by reactive oxygen species in neurotoxic response of PAMAM dendrimers, and antioxidants or autophagy inhibitors could be used to mitigate PAMAM dendrimers-induced neurotoxicity, thus providing potential strategies for alleviating the neurotoxicity of PAMAM dendrimers. Furthermore, the systematical elucidation of interrelation between reactive oxygen species and autophagy will also encourage the development of safe biomedical nanomaterials. PAMAM dendrimers: Poly-amidoamine dendrimers; ROS: reactive oxygen species; NAC: N-acetyl cysteine; LA: lipoic acid; CQ: chloroquine; HRP: horseradish peroxidase; IgG: immunoglobulin G; PBS: phosphate-buffered saline; CCK-8: Cell Counting Kit-8; BCA: bicinchoninic acid; SDS-PAGE: sodium dodecyl sulfate-polyacrylaminde gelelectrophoresis; PVDF: poly vinylidene fluoride membranes; BSA: bovine serum albumin; DCFH-DA: 2',7'-dichlorofluorescein diacetate; SD: standard deviations; PI3K: phosphatidylinositol 3-phosphate kinase; MTOR: the mammalian target of rapamycin; p70S6K: p70 ribosomal protein S6 kinase; MAPKs: mitogen-activated protein kinases; ERK: extracellular signal-regulated kinase. This work is supported by grants from the National Key Basic Research Program of China (2013CB932502, 2015CB931800), the National Natural Science Foundation of China (81573332), and Shanghai Science and Technology Funds (14431900200).